Here’s another reason to start the day with a cup of joe: Scientists have found that people who drink coffee appear to live longer. People who consumed a cup of coffee a day were 12 percent less likely to die compared to those who didn’t drink coffee. This association was even stronger for those who drank two to three cups a day — 18 percent reduced chance of death. 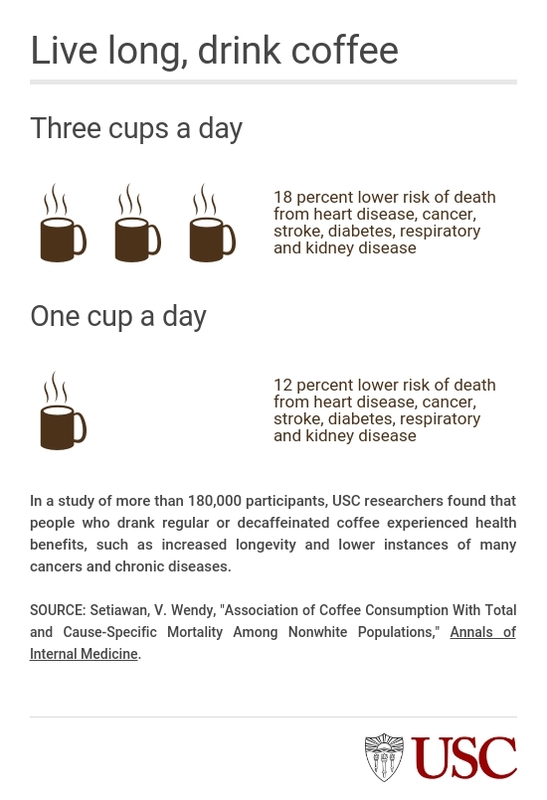 Previous research by USC and others have indicated that drinking coffee is associated with reduced risk of several types of cancer, diabetes, liver disease, Parkinson’s disease, Type 2 diabetes and other chronic diseases. They reported their coffee drinking habits when they entered the study and updated them about every five years, checking one of nine boxes that ranged from “never or hardly ever” to “4 or more cups daily.” They also reported whether they drank caffeinated or decaffeinated coffee. The average follow-up period was 16 years. Over the course of the study, 58,397 participants — about 31 percent — died. Cardiovascular disease (36 percent) and cancer (31 percent) were the leading killers. Setiawan’s previous research found that coffee reduces the risk of liver cancer and chronic liver disease. She is currently examining how coffee is associated with the risk of developing specific cancers.